With warm weather and beautiful sunshine, the season for walking has overtaken the peninsula. For those who are looking for a place where you can enjoy hiking and day walks while appreciating nature and the surrounding scenery, the Korean Tourism Organization (KTO) has recently published a list of its ten best walking trails in the country. The selected routes are further sub-categorized into either “easy” or “normal” courses. One of the recommended “easy” courses is the Juwang Valley walking trail at Juwangsan Mountain in Cheongsong-gun County, Gyeongsangbuk-do (North Gyeongsang Province). This 2.2 kilometer-long course begins at Daejeonsa Temple and runs to the Yongchu waterfall, passing the Jahagyo Bridge along the way. When walking along the path, visitors can enjoy the scenery of strange rock formations and cliffs. In the fall, there are wonderful views of the mountain, thanks to the beautiful autumn foliage. Cheongsando Island in Wando-gun County, Jeollanam-do (South Jeolla Province), is also highly recommended. The island’s slow path No. 1 is a must-see for visitors, as it is known as one of the most iconic tourist attractions in the country. This 5.7 kilometer-long pathway is famous as the backdrop for an award-winning movie, “Seopyeonje” (1993), directed by Im Kwon-taek. There are picturesque views of the green barley and canola flowers. Another easy course is the Bau-gil Pathway in Gangneung, Gangwon-do (Gangwon Province). When traversing this 16 kilometer-long beach-side walking trail, people can enjoy collecting sea shells. They can also find the birth place of Heo Gyun (1569-1618), a prominent politician, poet, novelist, scholar and writer during Joseon times (1392-1910), and his sister, Heo Nanseolheon (1563-1589). They can enjoy a cup of coffee along the so-called “coffee street.“ After passing “coffee street,” visitors will arrive at Jukdobong Park. A lookout point and a trail here were built in 2009. For those who want more challenging trails, the KTO recommends: the Mudol-gil No. 11 trail at Mudeungsan Mountain in Hwasun, South Jeolla Province; the Pilgrim’s Route No. 6 in Gimje City and the Takryu-gil in Gunsan-si, both in Jeollabuk-do (North Jeolla Province); and, the Hadong Park No. 2 Kyung-ni Road in Gyeongsangnam-do. At Mudeungsan Mountain in Hwasun, South Jeolla Province, there are 15 different walking trails. Among them, the 3 kilometer-long course No. 11 is the most highly recommended. This path is good to enjoy spring flowers, such as cherry blossoms and royal azaleas, in April and May. 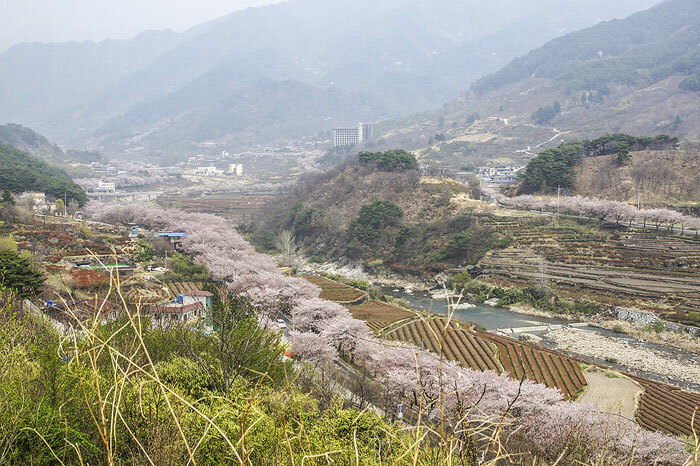 This trail was mainly used by residents of nearby villages to travel between Hwasun and Gwangju. They used the path to climb the nearby Manyeonsan Mountain to collect firewood in the winter or to gather wild herbs in the spring. Visitors can enjoy royal azaleas in full bloom and the view of another mountain nearby, Anyangsan. Pilgrim’s Route No. 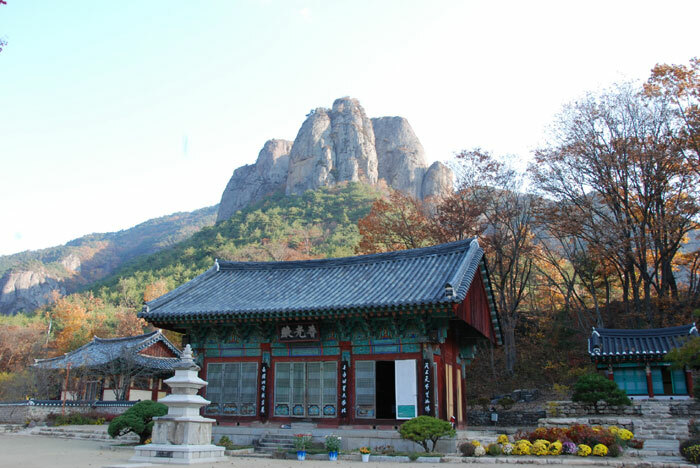 6 in Gimje City, North Jeolla Province, links Chonami, Geumgu and Moaksan Mountain with Geumsansa Temple. Walking along the 26 kilometer-long pathway, and after climbing Guseongsan Mountain, travelers will arrive at Gwisinsa Temple. It is known for its Buddhist nuns. Travelers will also find the Yeonriji tree near Geumsansa Temple along the slopes of Moaksan Mountain. The Yeonriji tree, also known as the “Love Tree,” shows people the true meaning of love, as it means that two trees with different roots can grow together as one. The Hadong Park No. 2 Kyung-ni Road is in Gyeongsangnam-do. Visitors can learn more about the background of a well-known novel by Park Kyung-ni (1926-2008) while walking along these pathways. The 13 kilometer-long course No. 2 links the Hwagae Street Market (Hwagae Jangteo) with the Buril waterfall, via Ssanggyesa Temple. When hiking, people will encounter the 60 meter-high Buril waterfall along the slopes of Jirisan Mountain. This trail is famous for its tree-lined street and flower paths. 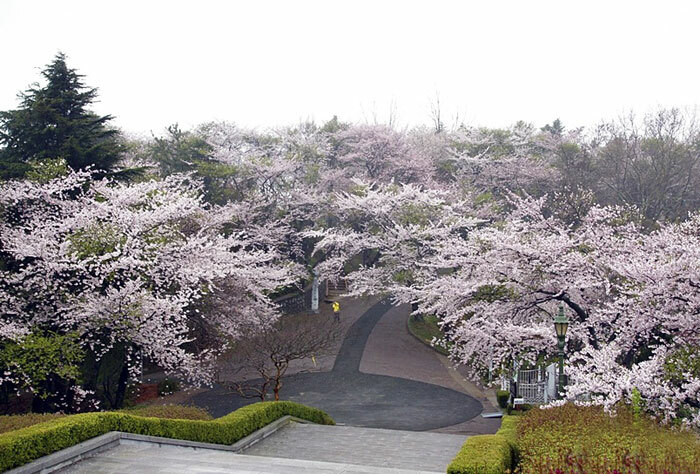 Cherry blossom and wild flower festivals are held in April and May, respectively. Another unmissable trail is the Gubul-gil in Gunsan City, North Jeolla Province. 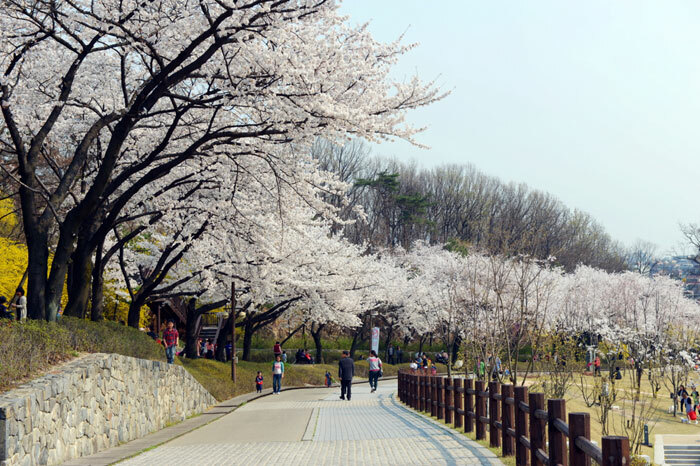 If you want to appreciate the spring flowers in Gunsan, Wolmyeong Park and Eunpa Lake Park are two of your must-see attractions. Wolmyeong Park is along section No. 6-1 of the Gubul-gil Pathways, also known as the “Takryu-gil.” This route got its name from a well-known novel of the same title by Chae Man-sik (1902-1950), as the novel is based in downtown Gunsan. By walking along the trail, people can learn more about the history of the city, from the Japanese colonial days through to the modernization of the country today. This route begins at the Gunsan Modern History Museum. Next to the museum is the city’s old customs building. The building is known as one of only three examples of Western Classical architecture in Korea. At Wolmyeong Park, visitors encounter a pagoda. This pagoda is a photogenic spot, as from the top of it they can view both the city and the mouth of the Geumgang River. In the spring, this park attracts visitors with its cherry blossoms and camellias and in the fall, with its autumn foliage. 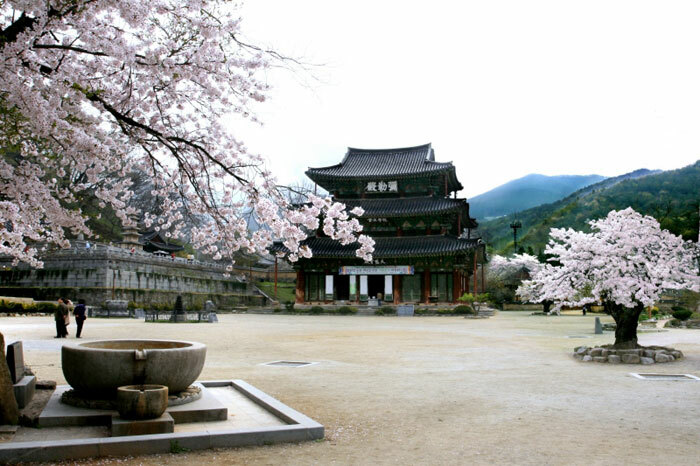 People can also find a Japanese-style accommodation house here, the Gowoodang Guest house, and the Dongguksa Temple, the only Japanese-style temple in Korea. While walking along, they can also find local specialties, such as Iseongdang, Korea’s first bakery with a 70-year history. 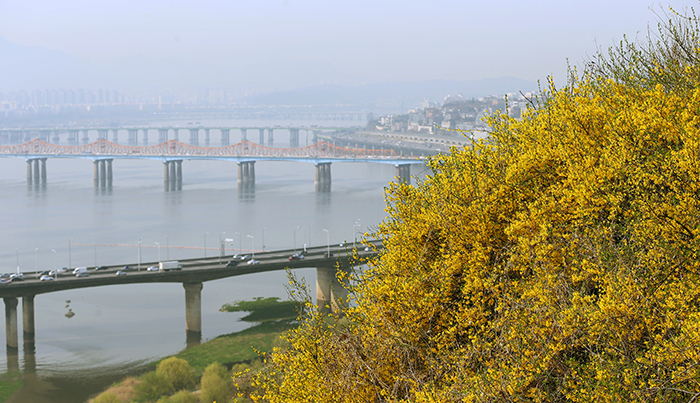 In Seoul and other places closer to the country’s largest metropolitan area, the KTO recommends the Haesol-gil Pathways of Daebudo Island in Ansan, Gyeonggi-do (Gyeonggi Province). These trails are in harmony between the ocean road and the mountain walkway. 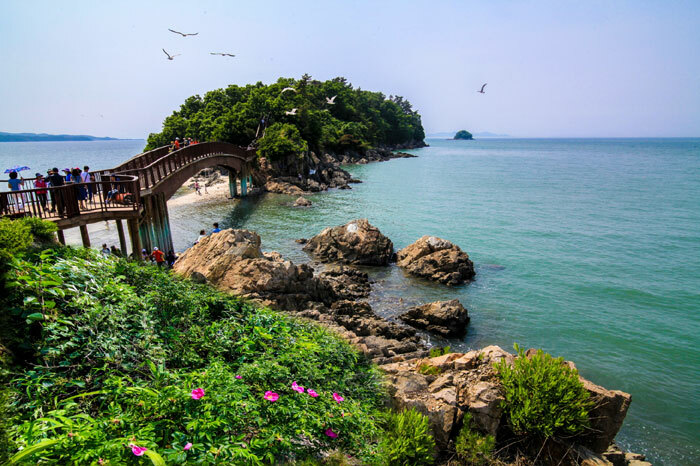 The trail leads travelers along the Sihwa Embankment to Daebudo Island. The seashore path lets you climb Bukmangsan Mountain. At the top, there is a wonderful view of Yeongjongdo Island, Songdo city and Sihwaho Lake. Travelers can also see the beach and mud flats while walking along the trail. At the Nakjo Lookout, you can enjoy a beautiful sunset over the Yellow Sea. In Seoul, the Dream Forest and the Seoul Forest are recommended. The Dream Forest is a huge, man-made forest forming parts of Odong Geurin Park and the old amusement park, Dream Land. You can get here by subway or bus. You can also find hidden historic spots while walking around the city. Dream Forest is located in Gangbuk-gu District. This 4.7 kilometer-long trail is good for people with strollers, so many families bring their young children here. 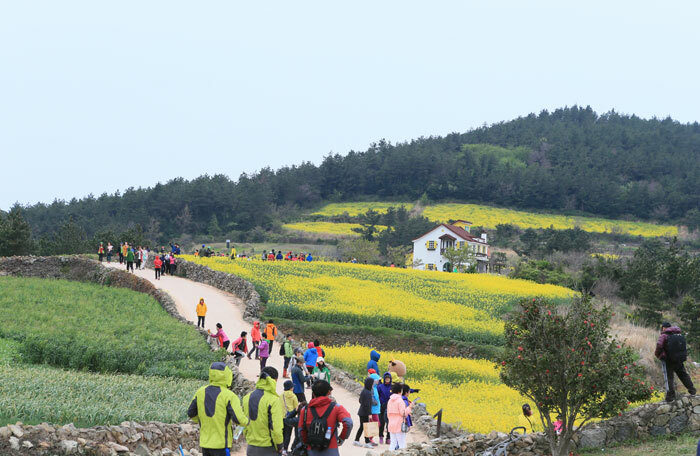 When walking along the path, visitors can find a beautiful view of Samgaksan Mountain. The lookout point is one of the best lookout points in Seoul. The Nadeul-gil Pathway in the Seoul Forest is in Jung-gu District. This trail stretches from Seoul Forest to Namsan Mountain, via Eungbong Park and Geumhosan and Maebongsan Mountains. People can easily find their way, as signboards are placed all along the path. 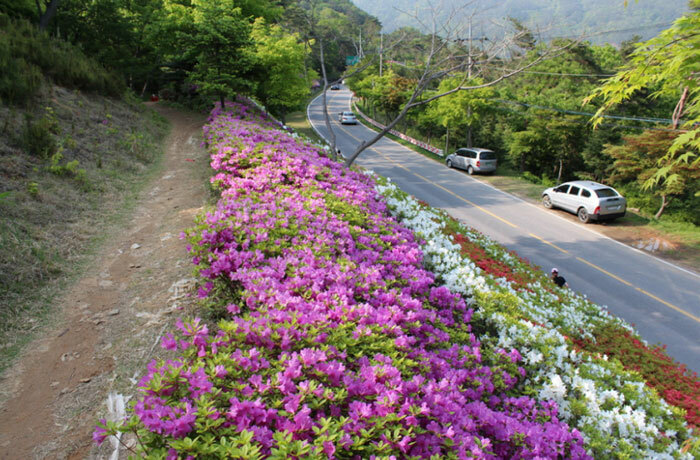 When climbing Eungbongsan Mountain, visitors can enjoy a clear view of the city. Maebongsan Mountain is good for strollers, as the path is paved. This path links to the fortress road of Jangchung-dong, one of the relatively easy fortress walks in the city. While walking along the fortress path, people will enjoy a great view of the city. More information about each of the mentioned courses is available at the KTO’s homepage (http://english.visitkorea.or.kr) with services in 11 languages.